After the first escalator was installed in the Mark Foy’s Emporium in Sydney, it didn’t take long for the new technology to spread around the city and interstate. The first escalator installed in Melbourne was in the Manchester Unity Building in 1932. The Manchester Unity Building was built in nine months from January to September 1932 as the headquarters for the Manchester Unity Independent Order of Odd Fellows (IOOF). The Building was constructed on the Dawson’s Street Corner: a popular meeting place for would-be couples. In the foyer of the Manchester Unity Building is an article written in the The Herald on June 15th, 1929 lamenting the construction of the Manchester Unity Building. “Melbourne is about to witness the passing of one of its most cherished institutions, and apparently without demur. No indignation museums are being arranged, no deputations have been planned, and no one has written to papers about it. And yet the fact remains that Stewart Dawson’s corner, as such, is doomed. The property in Swanston Street, opposite the Town Hall, was bought some time ago from Mr Stewart Dawson by the Manchester Unity Independent Order of Oddfellows, which intends to erect a new building on the site. 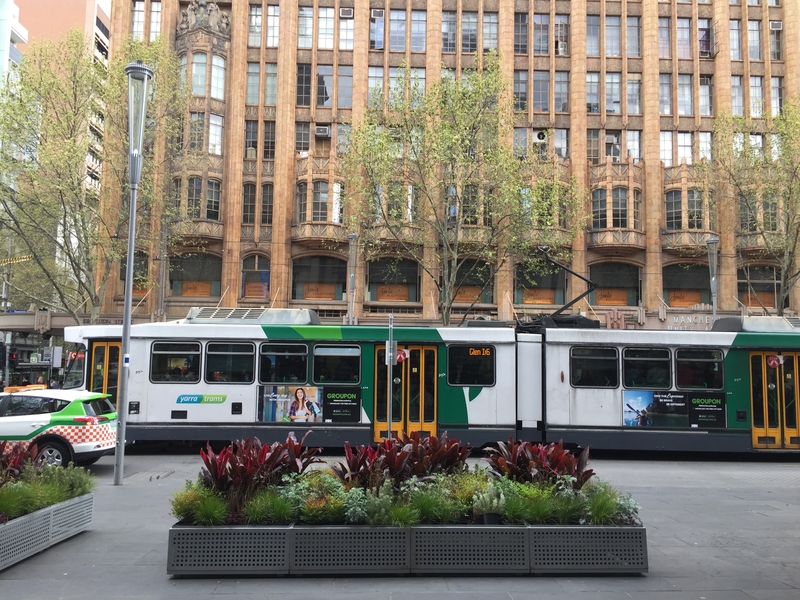 The north-west corner of Collins and Swanston Streets is something more than a mere corner – it is an institution hallowed with many memories. The corner was, shorn of much of its glory when the authorities, aided and abetted by an extremely practical but coldly unromantic police force, decided that footpaths were not fit places for idle gossip and lover’s tales, and framed move-on by-laws. Still, Stewart Dawson’s corner rose superior to this handicap, and continued in favour as a rendezvous. One can still stand there and hope “she” will come along – so long as one does not prolong the waiting process. Perhaps it is too early to mourn. One suspects that Mr. Stewart Dawson has built a memorial to his name which will last at least as long as the present generation, and the Stewart Dawson’s corner will continue to be so known for many years. via “Where romance made its home: the passing of Stewart Dawson’s Corner” – an extract from “The Herald,” 15th June, 1929. Eventually, the building fell into disrepair and it has undergone numerous rounds of repairs since it was first built. The most extensive repairs have occurred under the stewardship of Dr Kia Pajouhesh who, in 2003, bought the first floor of the building for his dental practice Smile Solutions. In the years that followed Dr Pajouhesh has gone to great lengths to painstakingly restore the building to its original glory. The best way to learn about the building and the full extent of the restorations is by taking one of their tours. More information is available via the Manchester Unity Building website. When the building opened in 1932 the escalator was described as a “magical staircase” and it received 60,000 visitors in its first day. These days the only remaining original part of the escalator is its wooden casing. Learn more about the history of escalators in Melbourne in the third episode of People Movers. Listen via Omny, iTunes or your podcast app of choice. Welcome to People Movers: a podcast series about the impact of escalators on everyday life. I’m Lindsey Green and throughout this series I’m going to talk to you about escalators in a way you’ve hopefully never thought of them before. In the last episode we took a trip to Sydney to learn about the first escalator installed in Australia. This time we’ll stay a bit more local and learn about the history of escalators in Melbourne. This is the second of two parts. If you haven’t listened to the Sydney episode yet, go back and listen to that one first. If you have listened to the last episode – you’ll know the history of escalators in Sydney was pretty challenging to research. But what about Melbourne? A tweet from the @Melbourne Twitter account on October 6 2016 was my starting point. Conveniently the Manchester Unity Building runs tours every other Sunday so I booked myself in to one and went along. I’ve walked past the Manchester Unity Building dozens, or maybe even hundreds, of times but this was my first time actually going inside. It’s an art deco building with an antenna spire that reaches 64 metres in the air. For my seven American listeners that’s about 209 feet. If you walk towards it from Flinders Street it’s the first building on the corner after you cross the Collins Street intersection. On the street level on the Swanston Street side of the building there’s a telco store on the corner, followed by a money exchange, a pharmacy, a drink shop, a factory outlet and then two sliding glass doors that open into the building. If you walk past it on the street without actually looking up at it you’d be forgiven for thinking it’s just another ordinary building. If you don’t live in Melbourne and you’ve never seen the building before, you can find photos of it on my website. It’s peoplemoverspodcast.com. On the day of the tour I arrived too early and sat outside the building waiting for it to start and I even encountered a little bit of sexual harassment in the process. Street cleaner: “Sorry about that. You looked so good I had to sweep under your feet” *laughs* thank you. My guide for the tour was a woman named Chloe Martin. She is studying a Masters of Fine Art and was previously a guide for the Louvre in Paris. Chloe (delivering tour): “feel free to move through a little way here everyone so you can hear me and if at any point in the tour I’m speaking too lowly or you’re having trouble hearing just give me a shout or raise your hand. I do my best to project but if I forget always worth reminding me. Is Georgina up here? Or have I lost her? Okay hopefully she’ll reappear. So I don’t know how many of you were expecting to visit the dentist today *group laughs* but that is where you have arrived. So to explain the Smile Solutions connection. Smile Solutions is a dental practice, clearly, it is the largest dental practice in Australia and it is owned by a man called Doctor Kia Pajouhesh and Kia is the most enthusiastic art deco collector that I have had the pleasure of meeting. C: He first moved into the Manchester Unity Building in 2003 and has since, as his business has expanded, he’s expanded through the building. His belief is that the building has very much helped his business and so his business should help the building so he’s personally committed to restoring and retaining the condition of the Manchester Unity Building and has been privately funding those heritage restorations. C: Georgina could I have you over here for a moment? C: Just to introduce Georgina: she’s an employee of Smile Solutions and it’s Georgina that’s giving us access to the building today. C: And Smile Solutions then have commissioned my research and presentation as well. I spoke to, Chloe, after the tour. L: How did you get into it? – guiding and this building? C: Into guiding or into touring for this building? L: Umm maybe both? I remember you said on Sunday that you were working at the Louvre? C: Yeah so that was my first guiding experience. I started working as an art history guide at the Louvre in 2014 while I was living in Paris and then that led to further opportunities for different kinds of guiding. When I moved back to Melbourne at the start of this year I was looking for similar work. It’s work that I’ve really enjoyed and the position was advertised here for a tour guide so I jumped at the chance. L: And when you go the job what was the process of learning about the history and becoming familiar with that? C: That was a really lovely process actually. Wo when I was given the position I was told that given my background in art history and architectural studies that they wanted me to undertake my own research of the building. There is another tour guide and previous tour guides that have their own scripts that they give, their own presentations that they give, but it’s really important to the people who facilitate the tour here that each guide does their own independent research, draws on those things which are the most interesting to them and speaks to that. So they have quite a few resources here that they’ve collected – anything that’s been written on the building and historical photographs and so on, so I was given a week to come into the offices here and to absorb all those resources and then to write my own version of the tour also drawing from the tour resources of the other guides as well. But that was a really lovely experience to be immediately entrusted with that information and to have the license to follow my own curiosities with the history of the building and my tour resources and the way that I speak and what I speak about has absolutely developed, it’s changed a lot in the year that I’ve been doing this because we have so many people come on this tour that know a lot about the building that have their own direct experiences with the building that have memories or have learned things themselves so it’s a bit of a patchwork now, it’s always being contributed to by the tour participants themselves. L: Yeah I was going to ask do you feel that you know everything or are you still learning? C: I don’t know everything I’m definitely still learning. As far as I’ve found no one has done a comprehensive historical study of this building, so the information available comes from pretty disparate sources, it’s not all solid, it’s not all completely reliable. I often find people’s personal memories a little bit more reliable than some of the things you’ll find online. There’s a lot of contrary information out there so I’m constantly learning. The more I do this I realise how little I know. L: What kind of people are you taking on tours? C: Overwhelmingly Melbourne locals or people from Victoria, sometime people who no longer live in Melbourne but did. It was something that I was really struck by when I first started giving this tour was the amount of people that would say ‘I’ve walked past this building for 45 years and now I’ve seen inside’. People that have a familiarity with it, have a connection to it, know it very well and that want to come and get a bit of a closer understanding or closer appreciation of it. And that was such a shock to me because all of the guiding work I’d previously done in the museum, also doing art and heritage tours, it was always foreign tourists or international visitors that you’re introducing them for the first time to something that they’ve never had an experience of and I expected that that would be the case here that it would be international visitors to Australia but it’s really not. We do have plenty of international guests come along but overwhelmingly it’s the Melbourne locals and that gives the tour a very different feeling because it does become a bit of a sharing experience. I have a lot to learn from the people that come to check it out. But of course – I was here to talk about the escalator. The escalator in the Manchester Unity Building is only one really small part of the tour, heard here with someone coughing in the background. C: The escalator here behind me was advertised as a “magical stairway”. It was the first escalator in Melbourne so it was quite a novelty. 60,000 people came in to ride it on the first day. So Luna Park must have suffered on that day. L: Do people seem particularly taken with the escalators? C: People always find it quite interesting that that was the first escalator in Melbourne. They find it humorous that it was advertised as a magical stairway and that 60,000 people came in to ride it on the first day. I think that is always a little bit mind boggling. We only have the one escalator here now, the other one is gone, and obviously originally it would’ve been a wooden escalator and it’s been replaced with metal now. The casing of it is original, the woodwork around it, but the steps have been completely redone and that would’ve been in the late 80’s that that change was made. Prior to that they would’ve been wooden steps. I suppose they’re a little less taken with it because on Sundays the escalator doesn’t function so they don’t actually go up the escalator as part of the tour. It’s more of a hindrance than a help on those tour days. But it certainly is fascinating when we have these conversations about it being the first escalator and the elevator being the first fully mechanised elevators in Victoria and that realisation that the history of this building doesn’t go back that far. It’s within the lifetimes of our grandparents but that life was so different, that these were such new and exciting technologies, I think that does… Especially that we start the tour at the escalator it captures people’s imaginations. It starts to give them a sense of that atmosphere, of excitement which came at such an interesting time because it was 1932 when the building opened, it was the absolute trough of the Great Depression so that there was this new excitement, this new technology, these great speeds and moving staircases, within that context, I think it does really take people back. Finally – I asked Chloe what she thought about an escalator history museum. L: My final question is a bit of a silly one. So the theme of the podcast is escalators and I’ve been toying with the idea of an escalator history museum. Based of your knowledge of the escalator in this building, do you think there would be enough escalator history to sustain a museum even if it’s a small one? In the next episode I’ll be looking into escalator safety. If you’ve ever had a scary escalator incident – get in touch. I’d love to hear from you. The music in this episode was provided by Tim and Dave of Umbra. You can find them on Facebook at www.facebook.com/umbraduo.